My Simon’s encyclopedia build. You wont see many of these floating around. Just need to find the note book first. Symnova organizer, plastruct plastic grid sheet and translucent acrylic rods, Sony Clie styluses, etched brass sheet, aluminum and brass rods/tubes and machined parts. Simon’s Birthday Cake from Firefly episode “Out Of Gas”. I had just never seen another built and thought, why not. 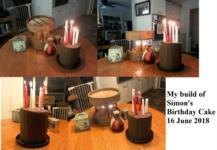 What started as a very old beat up coffee can, is now a every lasting cake. I added a few angles and other movie accurate items to the shot for more of a proper setup than it just setting on the table. I hope you like it as much as I enjoyed making it. Well not really art, but wasn’t sure where to post it. I watched this item for some time when it was listed for sale. But finally I just had to buy it. 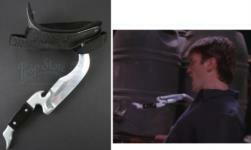 The actual stunt knife used in “The Train Job”. So after seeing where another Browncoat had made the Ice Planets, I decided to do the same. I made one for River, Book and even a hero size one for Jayne. 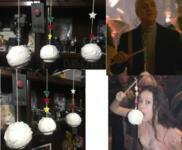 Not hard at all, just some Styrofoam balls, some paperclay, white spra paint and Mod Podge glue. The stick is a cardboard tube from a coat hanger. I did look closer at theirs last night, instead of sting her was on a spiral wire and on a wooden stick. It’s just much easier to hang/display on a sting. Here re the four different Catalyzers I built. 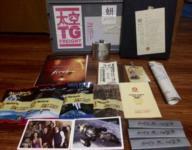 The first two on the left were recently signed by Jewel as you will see in next picture. But if you watch the show there are two more I could make. When pictured still on the engine It appears they still have the old military labels on them. The other in "Out of gas" when Mal is carrying the new part to the engine room in a few frames the top section is not cut down (where the copper top is) I have to cut approx. an inch off to fit the cap (like all of theirs) except in this scene his has the copper top but it rest much higher. But I finally got one and with help from others, working on stickers for the crate. 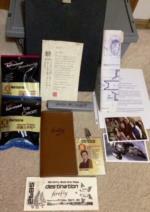 I just need to find the old Firefly flask (not Jayne's from loot crate)a VHS tape and a few other small things. But mine did come with the light-up ink pen. 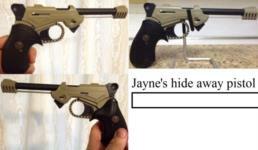 I finished my Jayne's holdout pistol from "Jayne's Town"
Thanks to Kurtyboy I was able to update the face plate. I have two of these, one like it appeared in the show and a cleaned up version as they cleaned up the one after the show (it really was a rental from a prop shop). Mine had a good photo used for the screen but now I have buttons, the correct lines in the screen and a numerical counter display. In the picture you will see some tape still on the new one, it was just holding it in place at the time of this pic. 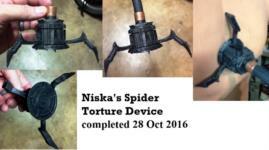 Thanks to Joatrash I was able to complete my Niska’s Spider Torture Device.